Just because you can store CRM information in a private knowledge base doesn’t mean everyone in your company should be able to see it all. Some information you store isn’t relevant to everyone. Some is simply private information. Your CRM’s group architecture is key for protecting information from various leads, clients, and internal team members. You can restrict access to knowledge by the members of the groups you define in your CRM. 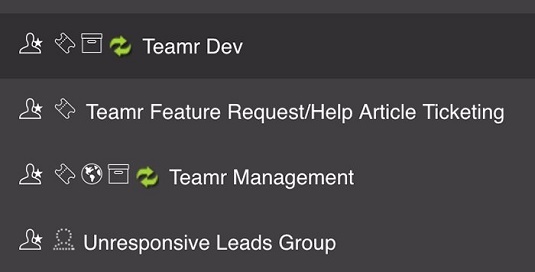 You should have separate groups for internal team members and your leads, clients, and vendors. Use these groups to store relevant information to the contacts in those groups. Separating groups that may have different knowledge bases. For example, you can store helpful onboarding documentation in a group dedicated to bringing in new clients. You can make some documents publicly available, some documents available only to the members of that group (your new clients), and some available only to the support team managing those new clients. Using groups to segment access prevents information from being distributed inappropriately. Depending on how rigorously you want to control your knowledge base content, you may want to allow a collaborative approach to your knowledge base. Give people you trust the ability to add articles or update existing content. Giving access to editing your knowledge base makes it easier to add more content to it, but you must also be aware of the risks. Have an employee you absolutely trust to review updates to ensure information stored is relevant and useful. When you build your knowledge base, you may want to share some of it with the public through a URL. Documentation on how to use your product or service is a common application for a public knowledge base. Other articles are for internal use only. These would be operational guidelines for accomplishing common tasks, organizational charts with employee information, and other things you and your team reference on a regular basis. 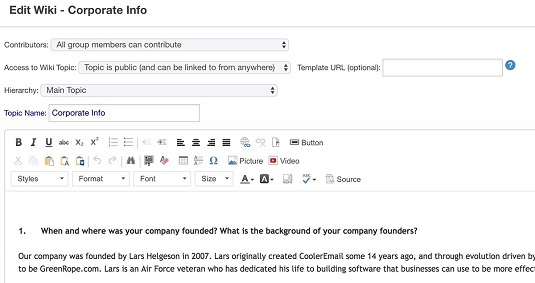 CRM software comes with an editor in which you can compose your documents. Editors allow you to control who can contribute or edit, designate whether the article is public or private, and where in the hierarchical structure the article should go. Knowledge base article editors should be flexible. If you’re writing for external consumption (people outside your company), spend more time to ensure proper grammar. You also want to write with a friendly tone, which takes more time than straightforward language. Keep your messaging in mind, as any public documents reflect your brand.